Challengers step up to "Ol' Bessie" and do their best to out-milk each other. 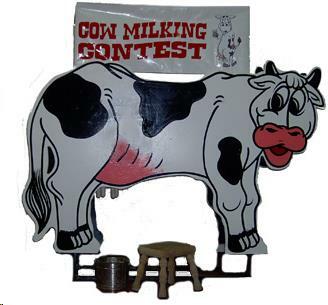 Cow milking competitions have been an attraction at fairs and festivals for years. Now it can be enjoyed without the hassle of a live cow! It can be played by one person using a timer or two contestants in "hand to hand" combat. Rental includes: milking cow, stool and bucket! * Please call us with any questions about our milking cow rentals in Columbia and Jefferson City MO.